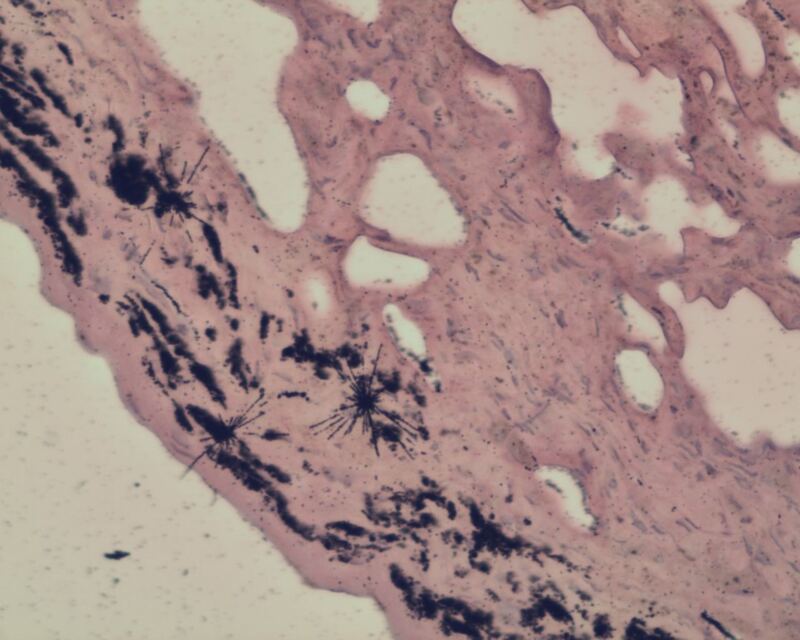 An autoradiograph of a human subject’s respiratory tissue shows alpha star aggregate of plutonium, localized within connective tissue along the pleura membrane that covers the lung. Other black material in the image is cigarette residue. Enlarge Image. Results: A study led by Pacific Northwest National Laboratory (PNNL) scientists offers new insights into the retention of plutonium-nitrate in the lungs-as well as clues as to the cellular processes and structural changes that might lead to tissue damage and tumor formation. In this unique inquiry, researchers from PNNL, Battelle Toxicology Northwest, and the United States Transuranium and Uranium Registries (USTUR) at Washington State University prepared, analyzed, and compared archived tissue samples from a deceased nuclear worker and beagle dogs. All of the subjects had inhaled plutonium. The research team sought to better understand what happens after plutonium-nitrate, a moderately soluble form of plutonium, is inhaled, deposited in the lungs, and retained. In both the human and beagles, there were statistically significant modifications in the expression of three regulatory proteins-Fas ligand (FASLG), B-cell lymphoma 2 (BCL2), and Caspase 3 (CASP3). FASLG influences the immune system and cancer progression; BCL2 regulates apoptosis, or cell death; and CASP3 also plays a role in apoptosis. The research findings suggest that these proteins, as well as apoptosis, are central in coordinating the body's responses to the long-term presence of plutonium-nitrate in the lungs. Why It Matters: While much is known about plutonium from biological, radiological, and toxicokinetic perspectives, there is not yet a clear understanding of the specific mechanisms by which ionizing radiation produces its effects or about the resulting long-term health consequences. The PNNL-led research sought to investigate whether plutonium retention produces elevated levels of cell death and to test the hypothesis that plutonium exposure results in alterations of expression profiles of selected factors. The study adds to the body of fundamental knowledge regarding lung morphology and gene expression modifications. "The methods used here undoubtedly will extend to future research, building upon the advances of this project," says Dr. William Morgan, a PNNL radiation biologist and member of the research team. Methods: The carcinogenic and inflammatory effects of plutonium-nitrate retention were examined from a human and large animal perspective. The project obtained tissue from a deceased nuclear worker who had accidentally inhaled plutonium approximately 38 years before his death. Tissue from another deceased nuclear worker served as a control. Both individuals had donated their bodies to science, and the tissue samples were stored at USTUR in light-sealed containers and maintained at a constant and appropriate temperature. The study also included tissues from 15 beagle dogs. The dogs were subjected to inhalation exposure of plutonium-nitrate as part of a 1970s study that continued for more than a decade. Tissue material was selected at random, prepared and examined using immunohistochemistry and quantitative reverse transcriptase-polymerase chain reaction techniques. An assay method—terminal deoxynucleotidyl transferase dUTP nick end labeling (TUNEL)—was employed to analyze apoptosis in the tissue samples. Sponsors: The work was funded by the Laboratory Directed Research Development program at PNNL. Subsequent funding was provided by the U.S. Department of Energy's Office of Biological and Environmental Research Low Dose Radiation Research Program, the Fred Hutchinson Cancer Research Center, the National Institutes of Health's National Institute for Allergy and Infectious Disease, and the Center for Medical Countermeasures against Radiation. Research Team: Christopher Nielsen, Xihai Wang, Robert J. Robinson, Antone Brooks, Jamie Lovaglio, Brian Thrall, William Morgan, and Jerry Dagle (retired), PNNL; Kristin Patton, Battelle Toxicology Northwest; and Stacy McComish and Sergei Tolmachev, USTUR. Nielsen CE, X Wang, RJ Robinson, AL Brooks, J Lovaglio, KM Patton, SL McComish, SY Tolmachev, and WF Morgan. 2014. "Carcinogenic and Inflammatory Effects of Plutonium-Nitrate Retention in an Exposed Nuclear Worker and Beagle Dogs." International Journal of Radiation Biology 90(1):60-70. DOI: 10.3109/09553002.2014.859765. Nielsen CE, DA Wilson, AL Brooks, SL McCord, GE Dagle, AC James, SY Tolmachev, BD Thrall, and WF Morgan. 2012. "Microdistribution and Long-Term Retention of 239Pu (NO3)4 in the Respiratory Tracts of an Acutely Exposed Plutonium Worker and Experimental Beagle Dogs." Cancer Research 72(21):5529-5536. DOI: 10.1158/0008-5472.CAN-12-1824.